It was a rough night for Big 12 teams on the bubble Monday. One team fell off the bracket and the other is getting close. 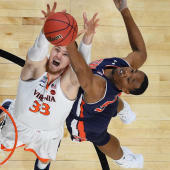 Tuesday's bubble slate is highlighted by the Iron Bowl of basketball and a team trying to prevent a conference championship from being clinched on its home floor. Texas dropped to 16-14 and off the bracket after losing to Texas Tech 70-51. The Longhorns have a chance of being the second team to get an at-large bid with a record less than four games above .500. They have no chance of being the first 16-loss team to get an at-large bid. The regular-season finale with TCU will be huge for both teams. Speaking of TCU, the Horned Frogs lost to Kansas State 64-52. TCU has now lost six out of its last seven and is getting close to falling out of the bracket. The Horned Frogs are 6-11 in the Big 12, but I only tell you that to remind you that the committee does not care about how teams perform in their conference. Conference records and placements are not on the team sheets. Lipscomb did what it needed to do and defeated Kennesaw State 86-71 in the quarterfinals of the Atlantic Sun Conference Tournament. The Bisons, the No. 1 seed in the A-Sun tourney, will host New Jersey Tech, the No. 5 seed, in the semifinals Thursday. The Boilermakers can clinch a share of the Big Ten regular-season title, but Minnesota is trying to stay in the bracket. The Gophers could use another quality win, especially away from home, but they will take it wherever they can. Alabama does not usually need extra incentive to beat Auburn, but at 17-12 and with a road game at Arkansas left, this could be the game that determines whether it makes the NCAA Tournament. If the Crimson Tide lose both, they enter the SEC Tournament needing a minimum of two wins to even get serious consideration. Oklahoma has won three out of its last four, but has a tough end-of-season schedule, beginning with the Jayhawks, who are still trying to stay in the conference championship race. The Sooners' best win this season is Wofford, so it would be good to improve on that.